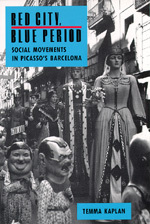 In Red City, Blue Period, Kaplan combines the methods of anthropology and the new cultural history to examine the civic culture of Barcelona between 1888 and 1939. She analyzes the peculiar sense of solidarity the citizens forged and explains why shared experiences of civic culture and pageantry sometimes galvanized resistance to authoritarian national governments but could not always overcome local class and gender struggles. She sheds light on the process by which principles of regional freedom and economic equity developed and changed in a city long known for its commitment to human dignity and artistic achievement. Although scholars increasingly recognize the relationship between so-called high art and popular culture, little has been done to explain what opens the eyes of artists to folk figures and religious art. Kaplan shows how artists like Picasso and Joan Miró, playwright Santiago Russinyol, the cellist Pablo Casals, and the architect Antonio Gaudí, as well as anarchists and other political activists, both shaped and were influenced by the artistic and political culture of Barcelona. Temma Kaplan is Professor of Women's Studies and History at the State University of New York at Stonybrook. Her previous book, Anarchists of Andalusia, 1868-1903, won the Berkshire Society Prize for the best book by a woman historian in 1977.